Table Cafe is a great little spot tucked away in Larkspur, a town just 10 or 20 minutes north of the Golden Gate bridge. A perfect place for lunch, Table Cafe offers gluten free dosas with a number of tasty fillings along with fresh salads, soups and homemade spritzers. All of their produce is local or organic, and their meats come from sustainable farms like Niman Ranch, Marin Sun Farms, and Prather Ranch. 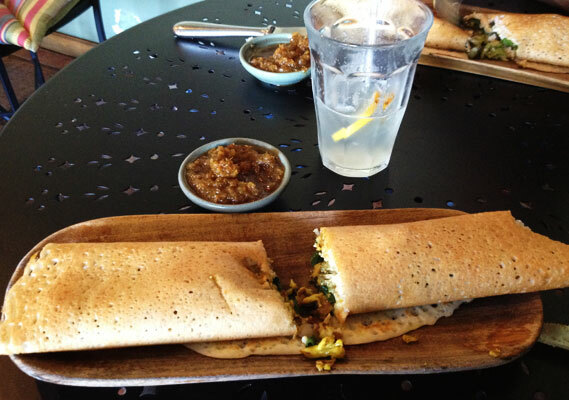 The cafe’s seasonal menu includes more than 10 different dosas, and an enticing lineup of daily specials. We ordered up two dosas, one stuffed with fresh asparagus and gruyere cheese, the other filled with curried cauliflower, pickled veggies, and wilted greens. I’m pleased to say, both were fantastic. Most of the menu is gluten free, however there are some items that do have wheat (brownies, lamb meatballs). Be sure to have their friendly waitstaff confirm that your order is safe. I just wanted to leave you a note to check out The Inspired Cookie. Their brownie is amazing!! !